Oils are important for maintaining our skin, hair, nail health among other things but when you come into a health store you tend to get overwhelmed by choice. In my case, instead of following the latest fad, I make sure I only use good quality olive, rapeseed, coconut and argan oils when I cook. Until recently I was also taking Neal’s Yard Beauty Oil for hair, skin and nails but when I was approached to try Udo’s Choice Oil ( Ultimate Oil Blend ) I felt happily inclined to give it a go. Our cells need the right balance of proteins, water, vitamins, minerals and essential fatty acids ( Omega 3, Alpha-Linolenic Acid and Omega 6, Linoleic Acid ) in order for us to feel our best. However most of us don’t eat an ideal diet, at times eat on the run, don’t get enough sleep and are faced with regular stresses-all the factors that deplete our bodies and its ultimate balance. Omega oils in particular help to ‘moisturise’ our skin from within, as well as protect skin’s natural defences and skin cells. As our skin is the so called ‘least important organ in the body’-by saying that I mean that our blood supply first goes to our vital organs like heart, brain, lungs, liver etc. and then disperses everywhere else within our body -it is the last to receive Essential Fats and the first to lose them. Omega 3 in particular is known for its anti-inflammatory effect hence without them we are more likely to get things like dry skin, dandruff, sunburn, cracked heels, dry elbows and stretch marks in pregnancy. Udo’s Choice Ultimate Oil Blend was created and formulated by Udo Erasmus in the 1980s, after his intensive, two decade long scientific study into the effect of fats and oils on our health. This multi-oil contains only the ”good fats”, vital for our well-being, and none of the bad ones, so it is essential to take this oil ‘neat’ and never to heat it or it will lose its composition and multiple benefits. – Organic Flax Seed oil ( can help potentially reduce risk of certain cancers. It is good for cardiovascular and lung heath as well ). 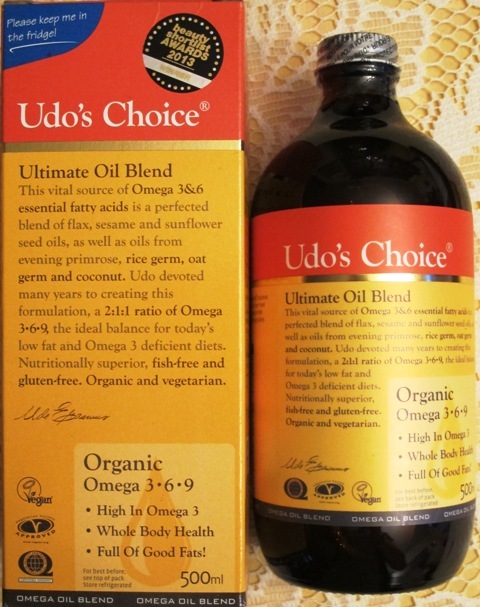 I have started taking Udo’s Choice Oil ( it has the colour of a bright egg yolk )over a month ago and have to say that it has become a daily staple of my diet. It might be a little bit of a strong taste for some ( it tastes nutty ) but I take a table spoon in the morning ( and like its taste, as it is ) but I also drizzle it over salads ( it goes nicely with Himalayan pink cooking salts ), add it to smoothies ( try blending one avocado, one banana, one teaspoon chia seeds, a large glass of coconut water and a table spoon of oil; or juice one apple and one lime, then blend it together with a cup of plain or coconut water, avocado, banana, teaspoon chia seeds and teaspoon of Organic Burst Spirulina -both of them work as refreshing energiser in the afternoon ). My other morning favourite is freshly made apple and celery juice with cinnamon and Udo’s Choice Oil or ”healthy breakfast on the run”– apple, ginger, banana and oat smoothie with added blueberries, Organic Burst Baobab and Udo’s choice Ultimate Oil blend. This oil also tastes great when mixed into freshly made porridge-I like mine with banana, grated apple and a little bit of date syrup – or burcher musli ). If you like your salads, than I will share the recipe that Tracey Robinson, a wonderful beauty PR ( Vert PR ) kindly shared with me ( she borrowed it from Nigella Lawson but added her own healthily delicious twist ): mash an avocado with salt, pepper, squeeze of lemon and chopped parsley on top of a lightly toasted bruschetta, drizzled with Udo’s. Or as a nice and easy lunch idea, make wholewheat pasta with pancetta ( drain access oil on the paper towel before adding it to pasta ), add some peas and drizzle Udo’s Choice over it, instead of butter. That’s the thing that I particularly like about this oil-it is amazingly adaptable and versatile, just make sure you don’t heat it and keep the bottle in the fridge once it has been opened. What makes this oil blend unique is the pioneering approach by Udo Erasmus when it comes to pressing and production of unrefined oils that puts priority on the health benefits, rather than the shelf life ( once opened the oil should be consumed within 8 weeks ). It is also cold pressed in a light and oxygen-free environment in order to preserve the oil’s nutrient integrity and quality. If you ask me whether I look or feel any different after taking this oil, an honest answer would be not really. But I like the taste of it and I know that I get the vital nutrients in my diet because of it ( just open the bottle and add to your drink or food ). Any dermatologist, nutritionist, tricologist or facialist will tell you that beauty comes from within and no amount of skincare will help you look well if your diet is unbalanced and unhealthy. A combination of oils like in Udo’s Choice is vital for staying in good health and that is the reason why I will continue taking it, and hope that the effect will be cumulative.